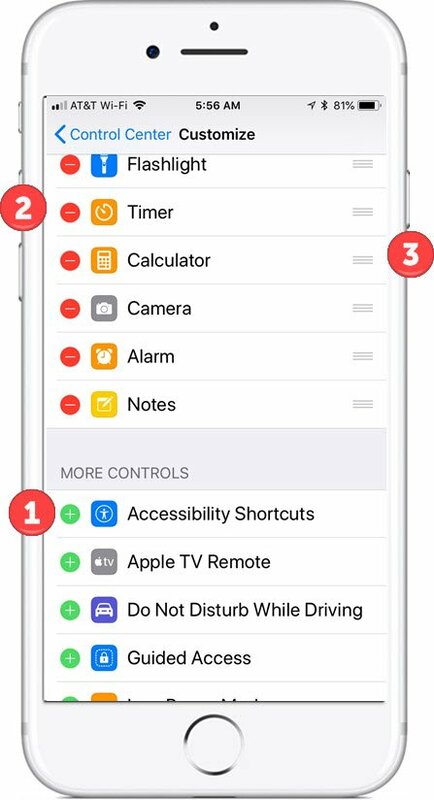 The Control Center is the management tool that provides instant access to controls for Airplane mode, Flashlight, Calculator, Camera and more. Access the control panel by swiping up from the bottom of the screen. Place your finger next to the home button to reliably pull the control center from the bottom edge of the screen. Use the same action on the iPad although you can also double tap the Home button to access. The new and somewhat hidden nugget on the Control Center is the ability to customize it adding additional icons and controls. For example, you can could add other frequently used apps and functions. 1 Add App – Tap to add this icon to the Control Center. 2 Delete App – Remove this icon from the current Control Center. 3 Move App – Move this icon within the Control Center.